Crews are battling wildfires in California, Nevada, Arizona, Utah, New Mexico, Washington, Oregon, Idaho and Montana, reports CBS News correspondent Stephan Kaufman (audio). More thunderstorms are forecast this week, but despite the likelihood of rain, forecasters expect most of the moisture to miss fire impacted areas. "Resources are stretched pretty thin, and demand is exceeding supply right now. But we're hoping to get on top of things in the next couple days and redistribute our critical resources," Tom Boatner, director of Fire Operations for the Bureau of Land Management, said on CBS News' The Early Show. Residents of about 50 homes fled a South Dakota wildfire that raced out of a canyon in the Black Hills, killing a homeowner who went back to retrieve possessions. It also destroyed 27 houses, authorities said. The fire near Hot Springs was one of dozens raging across the West on Sunday. In the eastern Sierra, firefighters battling a 34,000-acre blaze in California's Inyo National Forest gained ground as reinforcements arrived. "We had a pretty good spate of dry lightning from Friday through yesterday," Boatner told Early Show co-anchor Hannah Storm. "With these dry conditions and incredibly hot temperatures it means most of the lightning strikes start new fires. So there's been over 1100 new starts and they've grown very rapidly and very dangerously." Record heat has hit the West, reports CBS News Early Show national correspondent Hattie Kauffman. Near Las Vegas, it hit 118 degrees. People jumped in the fountains to cool off. Now, as the heat moves east, much of the nation is sweltering. For the sixth straight day, temperatures in parts of California's rich Central Valley are expected to top the 100-degree mark, reports CBS News correspondent Steve Futterman (audio), and farmers are nervous. "The damage is already done. You cant take it back," said Kerry Whitson, who grows plums, grapes, and olives. "i think everyone is concerned." Keith Watkins, who grows oranges and lemons, says consumers will feel the impact. "There's less fruits produced, less fruits packed, and that can cause higher prices in the market. Everyone's affected," Watkins told Futterman. Forecasters were calling for afternoon highs approaching 100 in Washington, DC, where the city government has issued a Code Orange alert, meaning air quality will be unhealthy for children, the elderly and people with heart or lung problems. An excessive heat warning was posted for the Philadelphia area, because of the combination of heat and humidity. It was 96 in downtown Chicago Sunday, not unheard of in July, but well above the average high of 83. The 53-square mile Inyo National Forest fire was 15 percent contained Sunday after cooler temperatures and lighter winds allowed firefighters to make their first real progress, Forest spokesman Nancy Upham said. "We're looking pretty good right now," Upham said. The fire skirted the popular John Muir Wilderness north of Mount Whitney and destroyed at least one home on the mountainside above the town of Independence. A lightning storm ignited the blaze Friday. Lightning also sparked the fire in the Black Hills on Saturday. By Sunday, the blaze had consumed about 9 square miles, injuring two firefighters and closing a section of a state highway, authorities said. One person was killed trying to retrieve possessions from a home. The victim's identity was withheld pending notification of relatives. "This thing blew up because of extreme hot temperatures and the winds," said Joe Lowe, South Dakota wildland fire coordinator. "It came out of the canyon with a vengeance." Gov. Mike Rounds toured the area Sunday and noted that the trees around some houses were charred but the dwellings were intact. "I don't know how in the world you saved some of those homes," he told firefighters at an evening briefing. More than two dozen homes had no damage because of a high-tech gel made of water-filled bubbles. Elsewhere, a wildfire burning in the Los Padres National Forest in Southern California tore through more than 6,500 acres Sunday as it continued to move into the rural hills. A water-dropping helicopter crashed, and two pilots suffered minor injuries, Santa Barbara County Fire Captain Eli Iskow said. The aircraft went down outside the fire lines and the cause was under investigation. 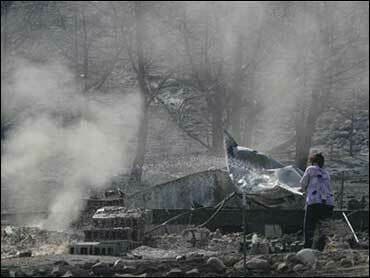 All air traffic over the fire was grounded for the day, hindering the fight. Investigators said the fire was ignited Wednesday by sparks from metal-grinding equipment being used on private property near Los Olivos. In Utah, the largest wildfire in state history grew to 283,000 acres on Sunday. The blaze has swept through about 442 square miles of extremely dry sagebrush, cheat grass and pinion juniper in central Utah. "This fire just ran away from us, and we couldn't put a dent in it," said Mike Melton, fire management officer for Utah's Division of Forestry, Fire and State Lands. The fire burned along the edge and in the median of Interstate 15 on Sunday, forcing a 60-mile closure of the highway between Interstate 70 near Cove Fort and Beaver for nearly five hours, Utah Highway Patrol Lt. Steve Winward said. I-15 could be closed again if the wind shifts, he said. In central Washington state, high wind near Wenatchee spread a brush fire that forced 250 to 270 homes to be temporarily evacuated. At least three outbuildings were destroyed by the 5,800-acre blaze. A fire in Arizona burned at the base of a mountain that is home to several expensive telescopes. A spokesman at Kitt Peak told KSAZ-TV he was concerned but not alarmed. Tankers were dropping retardant between the fire and the observatory, the station reported. In Nevada, about 1,500 evacuees from Winnemucca were allowed home hours after a wildfire destroyed an electrical substation and several outbuildings, shut down Interstate 80, delayed trains and killed livestock. No injuries were reported. "It was pretty hairy for quite a while, and people thought they would go back to nothing," Humboldt County Undersheriff Curtiss Kull said Sunday. "It was a huge wall of flame coming at the homes. It's amazing that no homes were lost." Flames up to 40 feet high threatened major power lines in the area feeding the eastern Sierra front and greater Los Angeles, fire information officer Jim Wilkins said. A 45,000-acre fire in Idaho was contained Saturday, officials said. Crews on Sunday raced to repair fire-damaged transmission lines that threatened rotating power failures.